There are so many great books out there it’s hard to know which to pickup first. 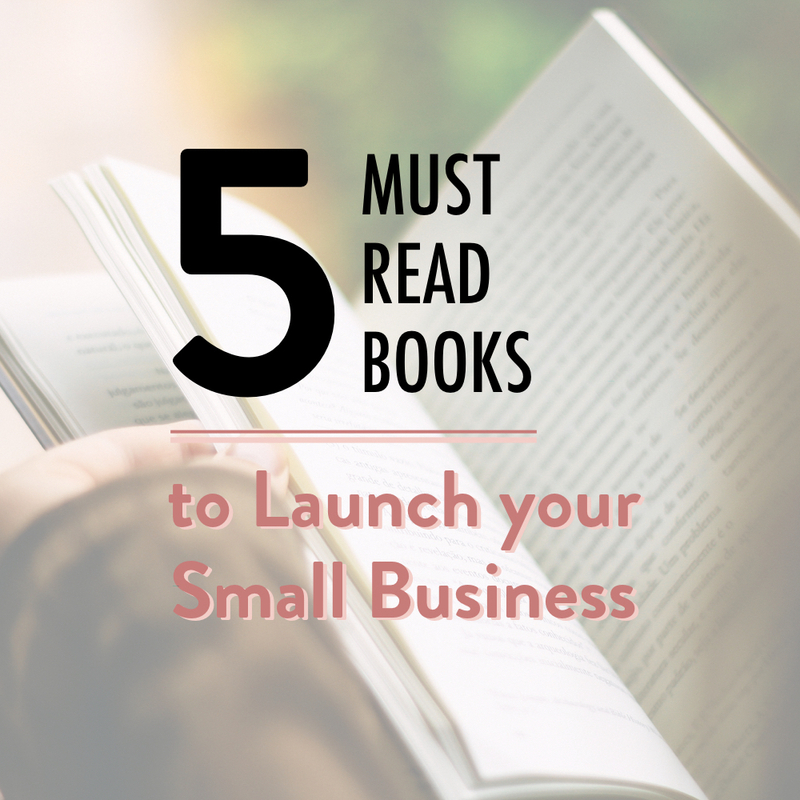 I’m going to walk you through my top five favorite books that I believe will be super helpful for any small business entrepreneur. Putting the practical strategies to use from these will definitely give a new entrepreneur a leg up on setting their business up for success. Even established business owners can learn a ton from these books and implement their tips at any time. My book recommendations are based around five areas. Choose what you need help with the most! WHY READ IT: If you don’t really know what to focus your business on or aren’t satisfied with the way your business is currently going, this book will help you figure out what to do about it. Designing Your Life teaches you how to apply a process called design thinking in order to experiment in your life and figure out what you really want and how to get it. It is all about experimenting, reflecting, learning, and adjusting til you get to where you want to be. This book wasn’t just written for entrepreneurs, but these principles are extremely helpful to figure out how to build your dream business. You’ll learn a new way to think about things that isn’t just beneficial to getting started, but also to how you run and grow your business for the long term as well. I went through this book with a group from my coworking space. At the time I felt like I was really spinning my wheels trying to figure out what I wanted to do with my life. This book kick-started my journey to get to where I am now, doing work I love and living a lifestyle that fills me up. TIP: Read this with others and go through the process together (they don’t have to be entrepreneurs but it would be ideal). GET THE BOOK: Designing Your Life. WHY READ IT: If you have solid expertise you want to build your business around, this book shows you how to turn it into a brand that sells itself. Badass Your Brand helps you focus your business and uncover your point of difference to stand out among a sea of competitors. She dives into how to package and price your services so that you set yourself up as an expert, get out of the $$ for Time game, and get out of the “push sales game” because your offerings practically sell themselves. I find Pia’s no-nonesense, tell-it-like-it-is approach very refreshing. And she’s walking proof of her methods. She went from $40,000 in debt running an agency with employees to starting over and making a half million dollars in a year. Talk about a comeback! Learning from Pia was a game-changer for me. She helped me get clarity on what to do with my coworking space, Platform 53, and was instrumental in my decision to launch this business (and how to approach it). It was some of the best business advice I ever received. TIP: Watch Pia’s super engaging and helpful free webinar Badass Your Brand: Crash Course which talks about some of the key concepts in the book to kick start your journey to badassery. GET THE BOOK: Badass Your Brand. WHY READ IT: Whether you want to admit it or not, we all have issues with money. This book helps you kick yo issues to the curb so you can make more, in the words of the author, cheddah. You are a Badass at Making Money is quite possibly the funniest book about money and mindsets you’ll ever encounter. Jen tells it like it is in this practical guide on how to recognize and then overcome your hangups with money that are holding you back from wealth. A lot of us entrepreneurs truly are in business to make a difference, yet the fact remains that you are still in business to make money. You are not a charity. A business is not a hobby. If making the amount of money you desire seems like an uphill battle to you, you’ll want to pick this book up right away. Going from a middle-class blue-collar family to making more money than I ever dreamed of in the corporate world to leaving and becoming an entrepreneur so I could do more meaningful and fulfilling work developed major hangups about money and making lots of it (but I didn’t even realize it until hearing Jen speaking and picking up this book). This resulted in less-than-stellar business results in my first business. Since shifting my money mindset with her advice, the momentum and earnings in my business have drastically spiked. TIP: Listen to the author-read audio book version for a super-engaging listen while you’re on the go. GET THE BOOK: You are a Badass at Making Money. WHY READ IT: If you aren’t seeing many results from your hustling or want to be more intentional with how you spend your precious time so it creates more impact, you’ll want to grab this book stat. The ONE Thing helps you reach your big goals by identifying the most important places to spend your time. It’s the opposite of multi-tasking, getting laser focused on the ONE thing you can do at a time to make everything else on your to-do list easier or irrelevant. The authors also believe in being a “maker in the morning and a manager in the afternoon” to make the biggest strides - blocking off several hours each morning to focus only on your most important work - that is, your ONE thing that day. This book transformed how I think about my to-do list, time management, and goal setting and it’s one I come back to time and time again. TIP: To dive in deeper and really learn how to apply this concept to your life, checkout these free ONE Thing resources that accompany the book and listen to their podcast, The ONE Thing Podcast. GET THE BOOK: The ONE Thing. WHY READ IT: If your sales are less than stellar or you struggle to explain what you do in a compelling and concise way, then pickup this book NOW. Building a StoryBrand uses the framework of a hero’s journey (famously used to create pretty much every movie ever) to connect with your customers and sell with ease. It helps you get in the psyche of the people you want to serve so that you can speak to them in a way that resonates and sets your brand up as the solution to their problems. This book was recommended to me by several people at a time when I was struggling to describe what I did. I knew that my website was less than clear and my inability to explain my business was stunting my business growth. I used the framework in this book and relaunched my website with all new messaging and viola! The reactions were instant and the feedback was amazing. People finally got it. Clients started signing on immediately. People could identify that I was selling something that they needed and sales became a breeze. Those results are a direct result of the changes I made because of this book. TIP: Use this helpful StoryBrand Brandscipt free online tool to follow along with the book and write the elements of your StoryBrand. GET THE BOOK: Building a StoryBrand. Besides reading these books, there are five foundational strategies I believe are essential for all entrepreneurs and businesses to figure out in order to be set up for success. Download my free step-by-step checklist below to help you figure out yours.